Babies and young children can access vaccines at no cost to protect them against serious diseases. 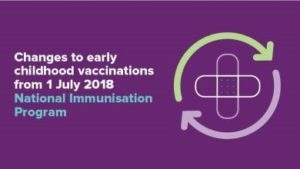 From 1 July 2018, the childhood immunisation schedule will be updated based on the advice of clinical experts. There are changes to the vaccines given at the 12 and 18 month schedule points. a pneumococcal vaccine will be offered to all children at 12 months of age (moved from 6 months of age). Clinical experts recommended this change to reduce disease in children and improve protection in all age groups through community immunity. a new vaccine protecting against 4 types (ACWY) of meningococcal disease (up from 1) will be offered to all children at 12 months of age. a vaccine protecting against Haemophilus influenzae type b will be offered to all children aged 18 months of age. Your child’s due date for their next vaccination has not changed – check to make sure your child’s next vaccination appointment is booked.